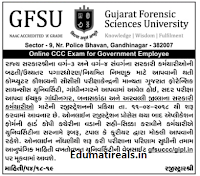 GFSU CCC Registration 2018 Start Now: The Gujarat Forensic Sciences University has invite online application for CCC GFSU Online Registration 2018 for only government employees for his promotion / higher scale. Today GFSU University has released notification for CCC exam registration in it’s official website www.gfsu.edu.in. As per notification GFSU CCC Registration 2018 Started on 11th April 2018. 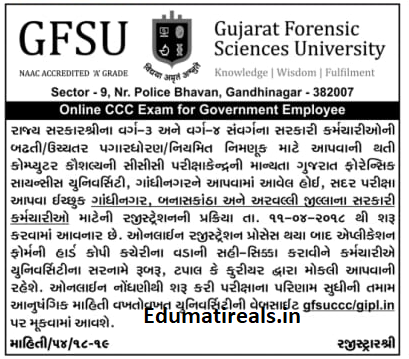 Candidates can check and Apply online GFSU CCC Exam Online Registration 2017 form below link.